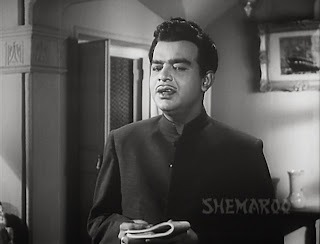 I mentioned in my last post that my father preferred to play the villain, I came to know about this from one of his interviews that I chanced upon long after he had passed away. Mum too confirmed this, after all one got a better opportunity to showcase one’s acting talent through such roles. I never saw Benazir in my father’s lifetime. Much later we did manage to get a video cassette, but it was such a terrible one that I could make head nor tale of the film. Recently I managed to get the DVD and finally I had the pleasure of seeing my father in Benazir. This was just the kind of role he enjoyed playing. He didn’t have to do anything indecent like molesting the heroine for instance. I had mentioned in my guest post for Memsaabstory - The Soft Hearted Villain, he disliked doing such scenes. 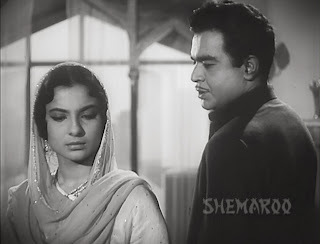 Benazir was not his first outing as a villain, Shama,another Muslim social co-starring Suraiya and Nimmi, which like Benazir was also in Urdu, came much earlier, but as I am still on Bimal Roy Productions, Benazir is the topic of this post. I have heard several things about Benazir from some of the unit members and I will be sharing those interesting bits of information and anecdotes with you. From what I have heard, S.Khalil the writer and director of Benazir had earlier made a film by the name of 'Bhaijaan' starring NoorJehan . After a quick search I found this song on You Tube, I think this is the film, unless there was another 'Bhaijaan'. Any way coming back to Benazir, Khalil was keen to remake this film with Meena Kumari and he was on the lookout for a popular banner that would present his film. 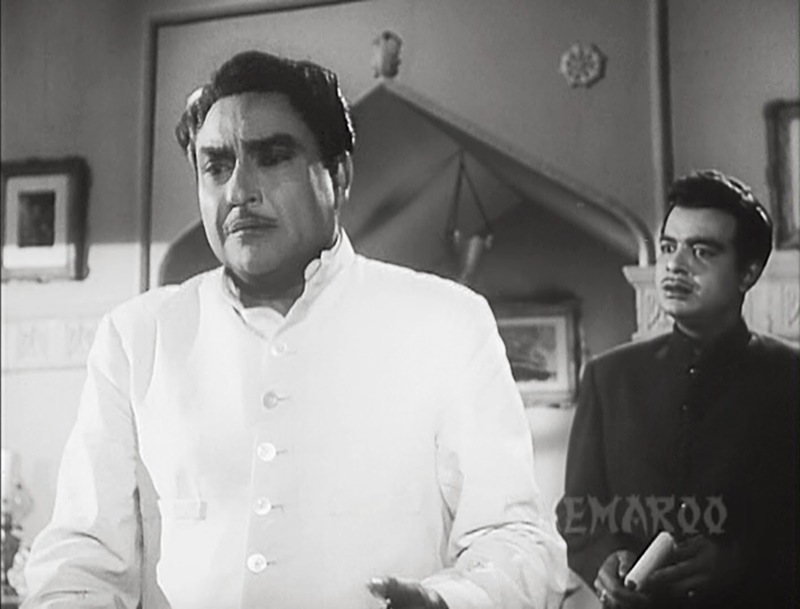 Bimal Roy initially agreed to present the film but I am told he later decided to step in as full-fledged producer. The film is about Benazir (Meena Kumari) a popular stage artiste associated with the Star Theatre in Lucknow. Afsar Nawab (Ashok Kumar) is a rich man who, despite being married (Nirupa Roy is his wife), is hopelessly in love with Benazir. He spends huge amounts of money on Benazir and Star Theatre. Benazir, however does not love him, she just respects him and is obliged to him. 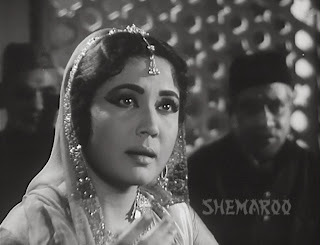 She, in fact, loses her heart to Anwar Nawab (Shashi Kapoor) who is Afsar’s younger brother. Anwar, blissfully unaware of all this, falls in love with Shaida his Bhabijaan’s (Nirupa Roy) sister. Shaida is only too happy to return his feelings much to the irritation of Shaukat( my father). Shaukat is Afsar and Anwar’s cousin. He has set his heart on Shaida who detests him. 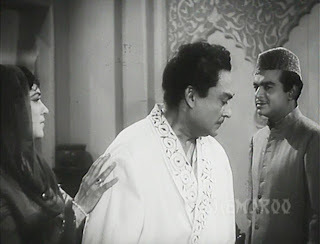 The evil Shaukat decides to create a rift between the two brothers by making use of Benazir as a pawn in his evil plan. 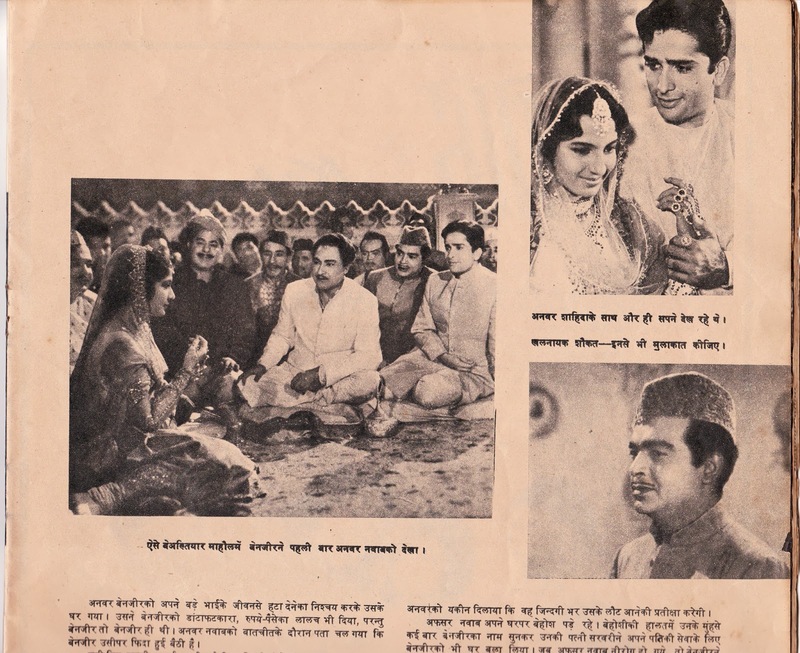 I loved my father’s performance in this film, his villainy was absolutely subtle, for instance there is a scene in this film when Afsar Nawab having discovered Shaukat’s mischief throws him out of the house, I noticed the slight scornful smile on my father’s face (see screen cap below) that was I think quite a subtle piece of villainy. I also enjoyed watching him do something quite different from what he usually did in one particular scene (watch the clip below). 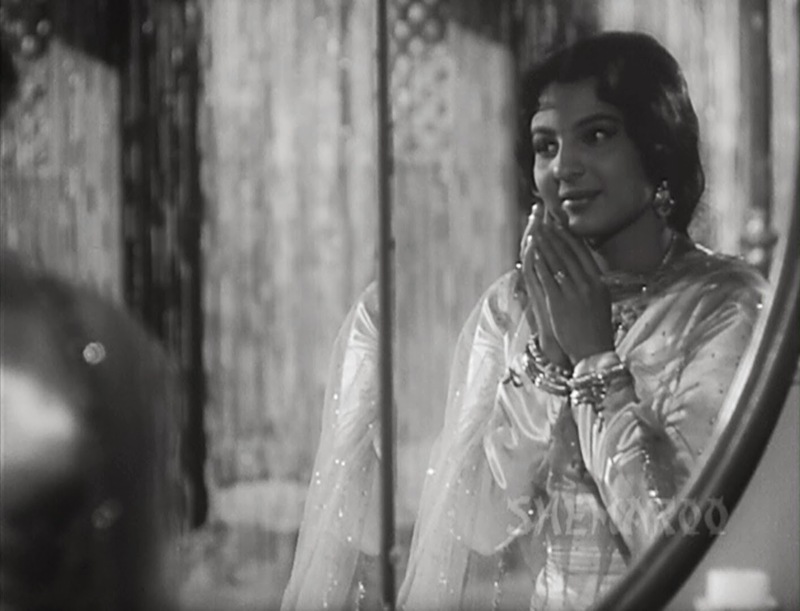 Incidentally in this scene you can hear Meena Kumari tunefully rendering some couplets in her own voice. That reminds me Meena Kumari had recorded some of her ghazals in her own voice, the album was called I Write, I Recite. 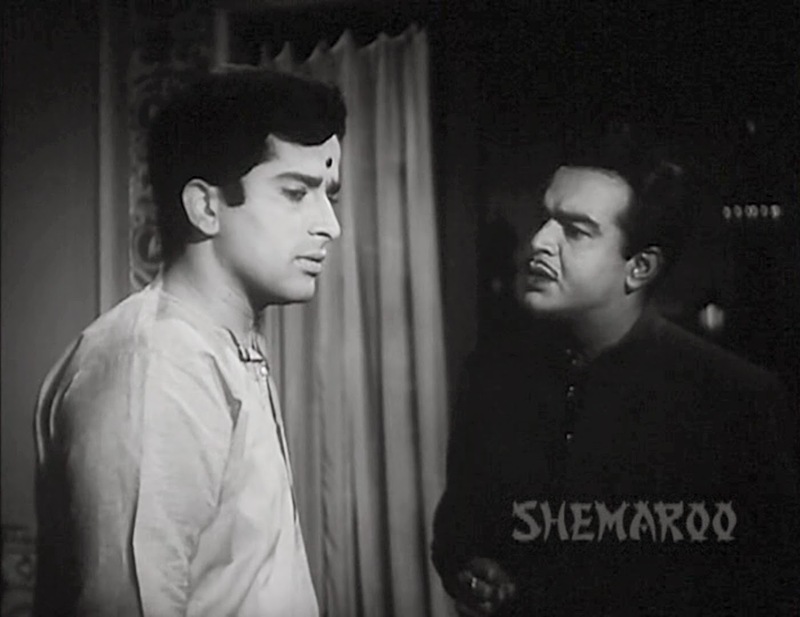 Meena Kumari initially refused to do the film, for she just couldn’t see herself working opposite a young Shashi Kapoor, whom she had seen as a child and who had almost grown up in front of her. However, she was coaxed by Khalil to do the film, and what was the result? Obviously not too good, she looks like his mother. Do you see the ad below? I chanced upon it when I was searching for my father’s interview where he had talked about his preference for playing the villain. 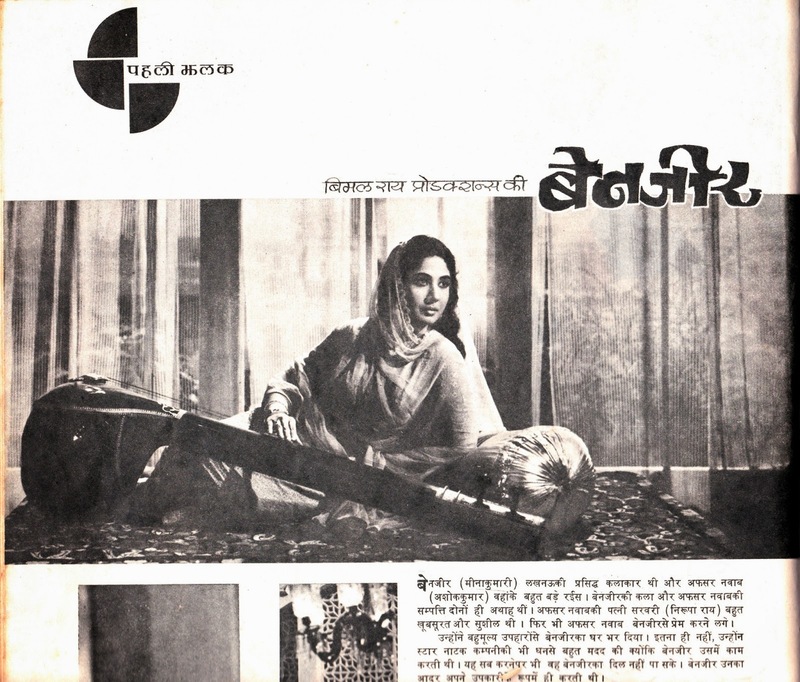 I could not find it, but I found this old Hindi film magazine called Suchitra, it is quite old, it is dated January 31,1964. According to my brother (that is, if memory serves him right) this magazine was the earlier avatar of one of the popular Hindi film magazines those days, Madhuri. This ad is of Limical, which I guess is short for limited calorie. This was for those who did not want to put on weight. You might well ask, what is this doing in a film blog?. Well you see, I am told that during the making of this film, while everyone had normal meals, Shashi Kapoor survived on Limical under strict instructions from his wife. 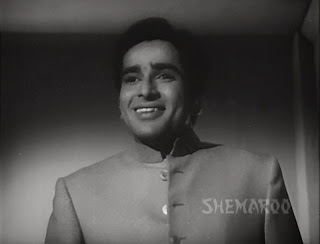 Mrs Jennifer Kapoor, I must say, was one sensible lady, Shashi Kapoor was the only Kapoor who was slim, trim and handsome. The moment his wife passed away and he decided to put on weight for his film 'Utsav', he never got back to his original shape and it is quite disheartening to see him on the wheel chair now. I also found this feature on Benazir in the magazine. My brother has some sweet memories of us visiting dad while he was shooting the scene you see below. My brother says that being kids we almost treated the set like our home and coolly went and sat on that couch (or whatever it is called) you see in that screen cap above. 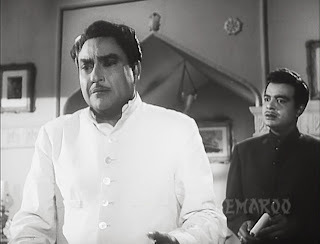 Ashok Kumar who was a very affectionate person very kindly told us to move from there, he said, “We are shooting here will you two please go and sit elsewhere.” My brother says (I have absolutely no memory of this incident) that his tone was very affectionate. 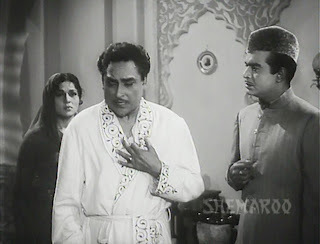 While watching the shoot my brother found it strange that Ashok Kumar was wearing a very light blue pyjama kurta. He was so used to seeing everyone wearing white pyjama kurta that out of curiosity he asked dad about it, that was when dad explained to him the technicalities that go into making of a film. The light blue, he explained, helped reduce the glare that resulted from pure white clothes while shooting a black and white film, when you see the film you do not see the light blue but white clothes. While on technicalities I have been meaning to talk about another aspect of film-making that was prevalent during my father’s time. In fact the reason I call this blog Tarun Bose and the World of Cinema is that I wanted it to be not just about my father but also about how the world of cinema was during his time. I would like to talk about it now; it is to do with the practice of dubbing a film. Sometime during the late seventies or perhaps the early eighties, film-makers in India began using Arriflex cameras. These cameras have the advantage of portability being quite lightweight as opposed to the motion picture cameras used during my father’s time. However, one of the disadvantages of this camera is that it makes a lot of noise, as a result the dialogues that are recorded on the set cannot be retained in the film, therefore the film-makers were and perhaps still are compelled to get the actors to dub for the film in sound proof recording studios. That was not how it was during my father’s time. The cameras then did not make a noise, therefore the sound recorded on the spot could be retained. On the spot recording meant that there had to be absolute silence on the sets. Right from my childhood I had learnt to be absolutely silent on the sets, I guess you cannot blame me for not being too enthusiastic about visiting the sets as a child, for the slightest sound would alert the sound-recordist and the director would shout “Cut”. The directors those days used to start shooting by saying, “ Start sound, start camera, silence, action!” That does not mean that actors did not have to dub at all for their films, they did dub but only those scenes which were shot outdoors where you have no control over the extraneous sound or noises that creep in while shooting. Sometimes while shooting indoors too, it was likely a sound would creep in unnoticed by the sound-recordist. All this impacted the clarity of the dialogues as a result of which those scenes too had to be dubbed by the actors. One of the advantages of this system was the actors did not lose their spontaneity; there was no need to artificially add sounds to a scene for the natural sounds could be retained. 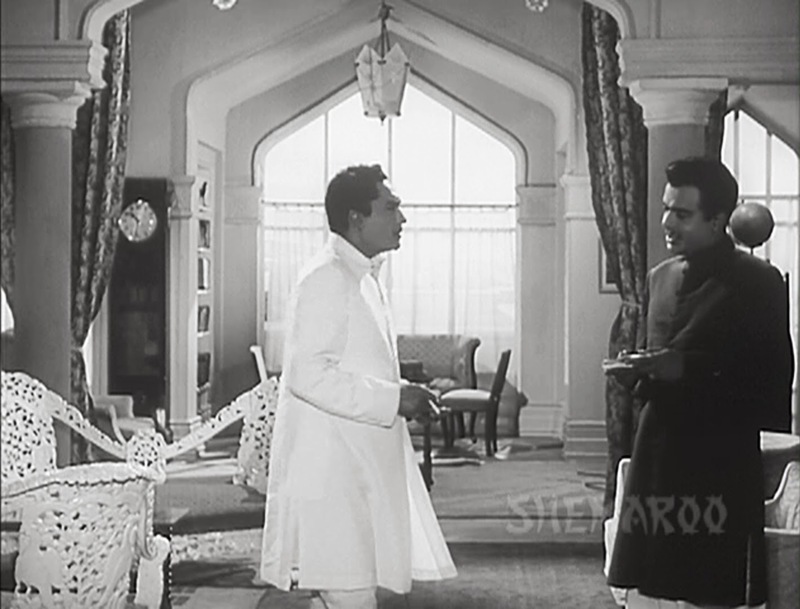 Just look at the scene below and please increase the volume and you will be able to hear the natural sounds of dad pouring the tea and the rattling sound of the cup and saucer as Shashi Kapoor places it on the table. I always felt whenever these sounds are artificially added it just doesn’t sound the same. In old films if someone is shown climbing the stairs you will be able to hear the hollow sound of the actor’s footsteps. The sound is hollow because the staircase is not made of brick and mortar but wood. Nowadays they add the sound artificially. The late actress Ush Kiron once noted in a television interview that one of the reasons she no longer felt like acting in films was this practice of dubbing. She felt emoting on the sets and directly interacting with your co-star was a different experience. Being able to reproduce the same emotion in the clinical surroundings of a recording studio was rather difficult. I agree with her for I always feel that ever since this practice of dubbing came in all the actors sound like they are delivering the dialogues in a somewhat measured tone. Besides, had dubbing been prevalent during my father’s time, I would not have had the pleasure of hearing my father’s voice in those films which had not been completed while he was alive. 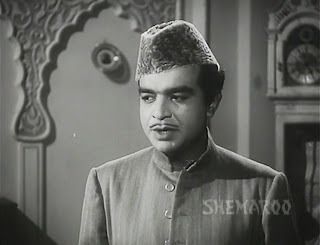 He had, for instance, completed the shooting of 'Ek Nazar' but it was still in post-production when he passed away. As the on the spot recorded sound could be used, they were able to retain his voice. I just cannot imagine those confrontation scenes of my father with Amitabh Bachchan without his own voice. Interestingly, I think it was during the nineties that some film-makers started using what they call sync – sound which I guess is obviously short for synchronized sound. It is a new term for what used to be done in the past. I guess they may now have some better cameras which help facilitate the use of sync-sound and of course much better equipment for recording the sound. What I found amusing was that while Usha Kiron was not comfortable with dubbing, Madhuri Dixit was not comfortable with sync-sound. When she came back to act in 'Aaja Nachle' after a long break, she said in an interview that she was just not comfortable with the silence on the sets, as she was used to noisy sets. However I do not think that all films use sync sound nowadays, dubbing still continues. It was really good to read an insider's view on filmmaking. Thank you for this Shilpi, and hope the series continues bringing us more such anecdotes. Thanks Ava, God willing I would like to take it to its logical conclusion,even if it means me moving at a snail's space. I remember TV show of the 80s, by DD Madras I think, where they showed Kamalhassan and Sunil Gavaskar talking to each other about their respective jobs. Kamalhassan mentioned that dubbing comes very naturally for him and demonstrated it. It sounded very natural. I forgot everything about that show except this one scene. The subtlety of Benazir reminded me in many ways of Bimal Roy. Glad you liked it Harvey. Actually there was more but then I wondered whether it is getting too long so I decided to delete some portions. Shilpi, may I just say with what pleasure I await your posts? As you so rightly point out, it is not just your anecdotes about your father that are so interesting; what makes it even more so, at least for me, is the glimpse into a world that has always fascinated me, a world that is so different from the one I saw during my days as a journalist. Thanks Anu, yes the film world has totally changed now. Shilpi, your posts are just so VERY absorbing. I never find my attention wandering even for the slightest moment - there's always so many interesting things to learn! Thank you so very, very much. I am truly grateful that you share all of this with the rest of us. 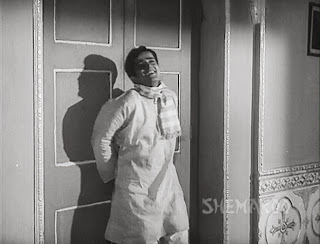 I loved that little bit of trivia about Shashi Kapoor and Limical, and that insight into the pale blue kurta-pajama... plus, all of that about dubbing. Incidentally, before I got to the end of that section (where you wrote about sync sound), I was reminded of a recent interview I read with Prithviraj, the Malayali actor who's recently starred in Aurangzeb. He said that he went through several months of very close tutoring in Hindi diction so that his accent was ironed out. "Because it's sync sound, one can't clean it up in dubbing or have someone else dub for me," he said. Glad you enjoyed it Madhu. Yes actors have to not only get the diction right, they also have to remember the lines. In a recording studio, they can have the dialogue right in from of them. Some actors simply find it difficult to remember dialogues, which usually leads to numerous cuts and loss of time and money for the film-makers. 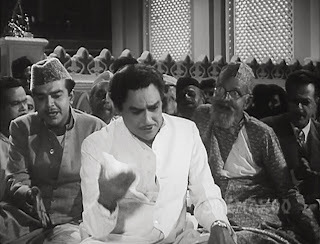 However back then too some of the actors' voices - those who had a problem with Hindi - used to be fully dubbed. My father himself dubbed for an actor who had a pronounced Marathi accent in Prem Patra. Do you remember which actor your father dubbed for in Prem Patra, Shilpi? Yes Madhu it was I think for the actor playing Sadhana's uncle. I had watched Benazir a few weeks back and had liked it too.I enjoyed reading your post,loved the way you shared the insides of the cinema and I am also loving these little-little anecdotes.Will be looking forward to your next post. Welcome to my blog and thank you very much. It feels great to know that all of you are enjoying my posts. Shilpi , enjoyed this blog too and waiting for more.With every blog you seem to refine the way you write. V r all njoying so lets move. One of the best things about reading your post are the video clips to support what you write. Even though one may have seen the film (and thus the scene) looking at it with your description gives it a totally new look. Enjoyed reading this. Waiting for the next. Thank you very much pacifist, okay now I will write freely, without deleting a thing. Welcome back Ash, glad you enjoyed it and thanks for the URLs.